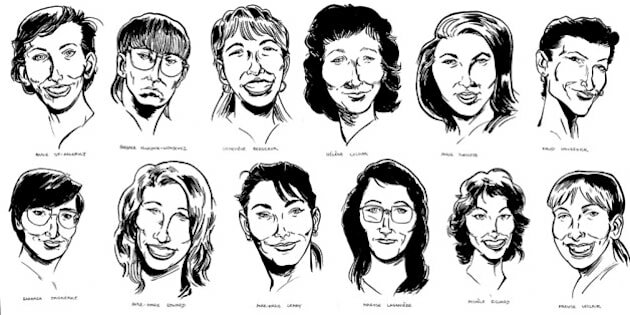 As Canada remembers the 14 women killed in the Dec. 6, 1989 École Polytechnique massacre, one Canadian is honouring them with phenomenal illustrations. Evan Munday, who lives in Toronto and works at Book City, shared 14 illustrations -- one for each woman -- on Twitter Saturday. "I can't say what really compelled me to draw each of the women. I felt like I had to honour them in some way, and I've noticed that the simple act of drawing someone can really have an impact," Munday told the Huffington Post Canada in an email. "It confirms that person's existence." Munday said he just "stayed up and drew 14 pictures," and that in the grand scheme of things he did "nothing." "There are so many other people doing way more to prevent violence against women and working to end misogyny," he said. "Mainly, I just want people to remember both their names and their faces. As well as the futures they could have had."